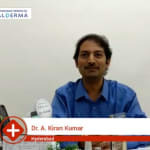 Dr. A Kiran Kumar is an experienced Dermatologist in Himayath Nagar, Hyderabad. He has helped numerous patients in his 18 years of experience as a Dermatologist. He is a qualified MBBS, Diploma In Dermatology, PGDMC (Post Graduate Dip. In Medical Cosmetology) . You can consult Dr. A Kiran Kumar at Hair and Skin Clinic in Himayath Nagar, Hyderabad. He has earned excellent reviews by 19 patients. Save your time and book an appointment online with Dr. A Kiran Kumar on Lybrate.com. Lybrate.com has top trusted Dermatologists from across India. You will find Dermatologists with more than 28 years of experience on Lybrate.com. You can find Dermatologists online in Hyderabad and from across India. View the profile of medical specialists and their reviews from other patients to make an informed decision. I have undergone prp treatment at Dr. Kiran Kumar's clinic for the past 6months. The results are very much satisfying. Dr is well knowledeable and listen to patient's problem. Dark Circles - 7 Ways They Can Be Treated! Dark circles are shadowy patches under or around the eyes.This can make your face look aged, tired and discoloured. Dark circles may also be accompanied by puffy eyelids and redness of eyes. How can dark circles be removed naturally? It is important to get enough sleep. A minimum of 7-8hours of sleep should be sufficient to rejuvenate and replenish your body cells. Drink water. The optimum level of hydration helps to prevent dark circles and many other body disorders. A balanced diet helps to renew cell growth, repairs worn out tissues and slows down the ageing process. Light massage promotes blood flow and improves circulation. It is important to quit smoking and reduce alcohol consumption. A cold compress helps to rejuvenate tired eyes. Green teabags help to reduce the darkening around the eyes. Cucumber slices also help to remove dark eye circles. What treatments are available for removing dark circles? Microdermabrasions a non-invasive non-chemical technique that makes use of a spray of micro-crystals in order to remove the superficial layer of dry and dead skin cells. Platelet rich plasma therapy is a new modality of treatment for under eye dark circles in which platelets separated from the patient’s own blood is injected in the area around the eyes, which then releases growth factors to give a more youthful appearance. Fillers are often used to smoothen the skin, giving it a more youthful look. Carboxytherapy is a non-surgical cosmetic treatment. It makes use of injections which inject gaseous Carbon-dioxide into the skin’s subcutaneous tissues through a needle. Intense pulse light therapy (IPL) is a non-ablative and a non-invasive mode of treatment that uses high intensity waves (pulse) of visible light to improve problems such as age lines, wrinkles, freckles, age spots and other blemishes. For the complete treatment of dark circles, it is important that a holistic approach is taken towards finding out the cause and customizing the treatment plan. To get rid of your dark circles and make yourself look 10 years younger, visit a Dermatologist at the earliest! Stretch Marks - 9 Tips To Treat Them Effectively! Pregnancy is a life-changing phase in a woman’s life. In addition to a baby (or babies! ), there are a lot of physical and emotional changes also that come with it. The more evident are the physical ones, and in addition to weight changes, the stretch marks are the most obvious. The uterus or the womb grows to its full extent to accommodate the developing baby, and so there is stretching of the connective tissue in these areas. After delivery, the tension is lost, and these marks become evident. These marks appear as lines on the skin and are most commonly found in areas such as the buttocks, arms, breasts, thighs, and stomach. They are different in appearance in comparison to the normal skin. It may appear pinkish or purplish initially and then it takes a shiny appearance later. When you feel the stretch marks, you may feel a certain indentation or ridge on the skin. It may feel sore or itchy as well sometimes. They most commonly appear during adolescence when there is rapid growth and stretching of the skin. It is also seen in women pre and post pregnancy. Stretch marks can also appear when there is a sudden change in weight. Use Moisturisers: People who use moisturisers show an increased elasticity of the skin, which reduces the appearance of stretch marks on the skin. Keeping the skin hydrated stops the skin from tearing and creating stretch marks. Moisturising is not entirely effective on older marks, but it can help with newly formed stretch marks. You can also use it in areas that are prone to stretch marks. Retin-A: Retin- A is known to boost collagen production that helps the skin to stretch out with ease and not cause tears. When Retin-A is used, it is recommended to limit sun exposure as the skin becomes more susceptible to sun damage and burning. Glycolic Acid: This chemical compound falls under the category of an alpha-hydroxy acid which is commonly found as a major ingredient in chemical peels. It is known to amplify the production of collagen and increase the tensile strength of the skin. Go to your dermatologist for a stronger dose for more effective results. A Combination of Retin-A and Glycolic Acid: A combination of these two potentiates the action of each other and gives better results. Vitamin E Oil: You can find Vitamin E oil capsules in medical shops that are known as the miracle medication when it comes to curing stretch marks. Essential Oils: Certain essential oils like rose oil, lavender oil, or geranium oil are known to reduce stretch marks. Vascular Laser: Pulsed dye laser that is kept at the wavelength of 585 nm is used to remove the stretch marks that are red and newly formed. It may not be effective on the older ones that have turned silver. This process is highly expensive and needs about 6 sittings. The efficacy of this procedure also depends on the complexion of the skin. Much like laser hair removal, the vascular laser does not work on darker skin. The color difference between the marks and the actual skin tone should be prominent. Fractional Laser Treatment or Laser Resurfacing: This is used to get rid of the older stretch marks that have turned light and are no longer red. This procedure is more expensive than the previous one and is prone to leave scars on the site of application. Abdominoplasty or Tummy Tuck: The only permanent solution to get rid of stretch marks is to cut them out entirely. If you are tired of the stubborn tiger stripes, then this could be your only way out. RF Micro-Needling Device: This is a more cost-effective alternative to CO2 Laser Resurfacing that could be used on any stretch mark types –“new and old”. The microneedles are driven directly into the skin to a certain depth (0.2mm-3.0mm) and radiofrequency (RF) energy is then released inside the skin. Minimally invasive RF thermal energy creates fractional electrocoagulation in the dermis which facilitates a natural wound healing process promoting the remodeling of collagen. Lifestyle Factors Affecting The Health Of Your Skin! Blemish free skin, which is supple and radiant is everyone’s dream, however, there are certain lifestyle habits which can take a toll on your skin and affect it adversely. Smoking can speed up the process of aging: Smoking can affect your skin adversely as it strips your skin of essential nutrients and oxidants. This leads to degradation of the basic units of the skin- collagen and elastin. The affected units also lead to uneven skin, appearance of fine lines and sagging. A study has also proven that smoking causes acne as the pores in your skin get blocked. Stress: Stress has the power to cause major hormonal imbalances inside your body, which can affect your skin. Stress affects the skin’s barrier function which reduces its ability to absorb and retain moisture. Dehydrated skin looks dry and patchy and becomes flaky over time, leading to acne. Not applying sunscreen: Your job might require you to stay outdoors for long, which exposes your skin to the harmful UV-A and UV-B rays of the sun and dust particles. In such conditions, using sunscreens with SPF (Sun protection factor) 30 or above is a necessity as otherwise, the rays can penetrate into your skin, weaken the collagen cells and lead to pigmentation and tanning in the long run. Sleep: Sleeping for less than 6 hours at night can make you feel sleepy and tired the next day. Your skin also deals with the lack of rest which is why the radiance is lost and can lead to problems such as under eye bags, dark circles and saggy skin. Poor nutrition: Poor nutrition which lacks in essential vitamins and minerals can cause serious problems in the skin. Including foods which are rich in vitamin C such as fruits lime, oranges and tomatoes and fatty fishes such as tuna, mackerel and salmons can help you retain radiant skin. Adding colourful fruits and vegetables to your diet will help you detoxify your skin and get acne free and supple skin. Microdermabrasion Or Chemical Peel - Which One Is Better? Many factors come into play when evaluating the health of our biggest organ, the skin. It is always exposed to external elements and hence sustains most potential damage. When choosing the proper treatments and products to enhance your skin, you should take into consideration such factors as skin pigmentation, acne, fine lines, wrinkles, skin sensitivities, oiliness or dryness. Exfoliation procedures can be physical or chemical. Which is best for you? The best way to decide on Microdermabrasion vs Chemical Peel is to review the benefits and expectations of each procedure. Microdermabrasion is the most common physical method for removing the very superficial level of the skin. It is a manual exfoliation of the epidermis to remove dead skin cells, debris and impurities. Normally, an instrument, which combines suction and a wand made of diamond or small crystal particles, is used to remove these from the skin. Microdermabrasion produces instant results, but may not be a good choice for inflamed, sensitive or rosacea type skin. In such cases look for resurfacing methods that utilize a dermafile, a manual exfoliation using diamond files. This technique reduces breakage of capillaries in someone with thin or sensitive skin. Microdermabrasion encourages collagen stimulation and a more rapid cell turnover in the skin. Crystal tip – A mixture of fine aluminum crystals are used to abrade the skin, as the cells and debris are blown away. Diamond tip – Very fine diamond particles are used to remove any dead cells, oils, or debris, as these are also suctioned away. Microdermabrasion should leave the skin’s surface velvety smooth, soft, bright and glowing. This rejuvenation method is instant and in rare cases, a pinkness or sensitivity may occur a few hours directly after the procedure, lasting less than 24 hours. Microdermabrasion is a workhorse of all rejuvenation procedures. Although it is primarily used on the face, it can be used on any part of the body, from the neck to chest, to hands, etc. Microdermabrasion is frequently done on the same day prior to other rejuvenation procedures for maximum benefits. Whenever we take a step outside, or take a ride in a car our skin is exposed to harsh elements, pollutants, and harmful ultraviolet rays. With exposure to these elements, the skin is potentially damaged, leading to the aged appearance. Chemical peels remove damaged cells; stimulate the growth of the new skin cells and collagen production. Different peels are used for different purposes. They can and should be customized for each patient’s particular skin types and problems. There are wonderful new combination peels that are safe, effective and have minimal down time. Anyone undergoing a chemical peel must stay out of the sun from 6 – 10 days and needless to say continue to use sun block. It is always best to consult your physician when determining what will work best for your individual case and to help you accomplish your rejuvenation and/or skin-improvement goals. In case you have a concern or query you can always consult an expert & get answers to your questions! Hair transplant is usually opted for by people who are experiencing balding. In this procedure hair follicles are taken from one part of your body which has abundant hair and it is then placed on your scalp where you are experiencing balding. The site from where the hair is taken is called the donor site, hair transplant can be used to fill eyelashes, chest hair and pubic hair. In this procedure, the surgeon cleans the scalp of your head and then injects anesthesia so that your scalp can become numb and you don’t feel a thing. There are two methods used in this procedure, follicular unit extraction (FUE) and follicular unit strip surgery (FUSS). In follicular strip surgery (FUSS), the surgeon usually removes 6 or 10 inches of skin from the back of your head. Since the back of your head has more hair in comparison to the top part of your scalp. He, then, sews that area of the scalp. The area is usually hidden due to dense hair in that region. In follicular unit extraction (FUE) surgery the surgeon generally removes hair follicles one by one from the back of your scalp and inserts them in the desired area where you want hair. Botox For Men - What Can Be Expected? I have small brown pigmented lesions around my ankles which have been there for a couple of years. I do have itching around my ankles rarely, but not too often. I do have sensitive skin and my epidermis gets peeled off if I scratch too vigorously after an insect bite. I don't have any such pigmentation anywhere else on the body. I also don't have a job in which I am required to stand at one place for a long time. Please if you have any idea what problem it might be, please tell me the differentials. Thanks. That pigmentation around ankles may be because blood vessels rupture and blood collecting there due to prolonged standing. I have small pimples all over my face. I have tried cleaning up the face regularly and also medicine like Boroline or Sufromicine. But no such improvement. In winter it get a little improvement but in summer just worst than a hell. It's about 2 year I am facing this problem all over my face. Please help to solve. Those are comedone, we have to remove comedone and apply salipeel every 15 days, if we do it repeatedly for 6 to 8 times it will clear.